The rift between President Goodluck Jonathan and Rivers State Governor Chibuike Amaechi resurfaced over the weekend when the governor called on Rivers people, especially the Kalabari, to vote him out in 2015 Presidential election. Amaechi spoke at Degema, the headquarters of Degema Local Government Area of the state, after commissioning an 8,000-sitting capacity football stadium complex built by the local government administration. Amaechi said the President Jonathan led PDP government has nothing to offer Kalabari and Rivers people, stressing that one way for the people to regain their lost oil wells and benefit from democratic governance was to vote out the PDP. Amaechi explained that the president was taking sides in the Soku oil wells matter given the reason why the wells were ceded to Bayelsa State. “As President of the Federal Republic of Nigeria, he is not supposed to take sides. The moment he said it is called Oluasiri, he is taking sides and we have no faith in Mr. President returning our oil wells. They have taken the (Soku) oil wells, they are spending the money because they have the presidency. The only way you can get back your oil wells is to vote out Mr. President. The only opportunity you have now is your vote. Vote him out, he is not Rivers, he is from Bayelsa. He has not and will not serve us and I have said here, let Mr. President tell us what he has done for us,” he said. He also alleged that his efforts to build trans-Kalabari road in the state and reconstruct the Emohua-Abonnema federal road already in deplorable condition was frustrated by the president. He therefore called on the people to fight for their rights by using their voting strength to correct all anomalies by voting out the ruling PDP. 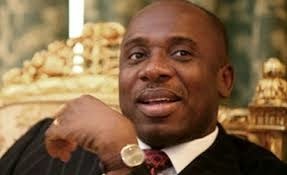 Is Governor Rotimi Amaechi, attempting to sow the seed of discord in Rivers State??? 2015 presidential election is 6 months away but that doesn't stop the speculation that's already rampant over who will run and how they'll do. PDP and APC have already drawn the battle line! Let the battle of words begin!